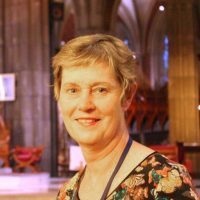 Sophie Andreae has praised the beauty of St Patrick’s Cathedral in Melbourne. A British expert in heritage and architecture has told a Melbourne conference that the Church in Australia shouldn’t underestimate the importance of its buildings just because their history only dates back two centuries. Sophie Andreae, the vice-chair of the Patrimony Committee of the Bishops Conference of England and Wales, is one of the keynote speakers at this week’s National Liturgical Architecture and Art Council symposium “Where Your Heart Is, There Your Treasure Will Be Also”.Ms Andreae said while Christianity only dates back to the late 1700s in Australia, it has parallels with the Catholic Church in Britain, which was suppressed – even prohibited – for more than two centuries. Despite the fact the earliest Catholic places of worship in Britain date back to just the late 18th century, when Catholics could again practise their religion, about 700 of the 2500 Catholic churches have been deemed to have heritage value. By contrast, about 12,000 of the 14,000 Anglican churches in England, many of which began as Catholic churches in the centuries before the Reformation, are heritage listed. As a result, many Catholic churches have been underappreciated because of their relative youth. “When one thinks of the beautiful churches in England, one often thinks of medieval churches – which are all now Church of England buildings,” she said. Some of those churches were featured in A Glimpse of Heaven, a book published by Historic England – the government agency focused on the preservation and restoration of buildings of historic significance. The book is now in its third edition, having proved very popular. Ms Andreae was full of praise for St Patrick’s Cathedral in Melbourne, which she said has survived the type of reordering that many Catholic churches in Britain underwent in the 20th century – including some in the same architectural style. She said many people reacted against Victorian architecture during the second half of the 20th century. That attitude, coupled with liturgical changes after the Second Vatican Council, “seemed to give some people a green light to rip out the interiors of churches”. That included the whitewashing of once-vibrant statues, the removal of some holy objects and what some now consider the hurried redesign of church sanctuaries. “Now, decades later, a number of bishops and others are trying to recapture the beauty and colour of those churches and to see how the sense of the sacred can be restored,” Ms Andreae said. Ms Andreae said in this short visit to Australia, she has been impressed by the level of interest in liturgical heritage and architecture, including through the symposium and the more than 100 delegates it attracted. “In many ways, Australia might be ahead of Britain in this work,” she acknowledged, pointing specifically to a new cataloguing tool for parishes and diocese to keep track of their sacred objects. In England and Wales, a project to document the history of each Catholic church – Taking Stock – is nearing completion. Ms Andreae said that work will allow any decisions on the future of churches to be informed by their past. “Does the Catholic Church, here in Australia and elsewhere, fully understand the importance of the heritage it has? “That understanding can help a parish or a diocese consider the heritage value of each building and consider how a church might be altered to preserve and enhance that heritage,” she said. This entry was posted in Uncategorized on February 7, 2019 by ACBC Communications.